The president’s announcement on Monday that Bears Ears National Monument and Grand Staircase-Escalante National Monument would be reduced dramatically has significant consequences for outdoor recreation in Utah. The outdoor community, including Outdoor Alliance, Access Fund, American Alpine Club, and the Outdoor Industry Association worked closely with legislators and decision makers to protect the region. 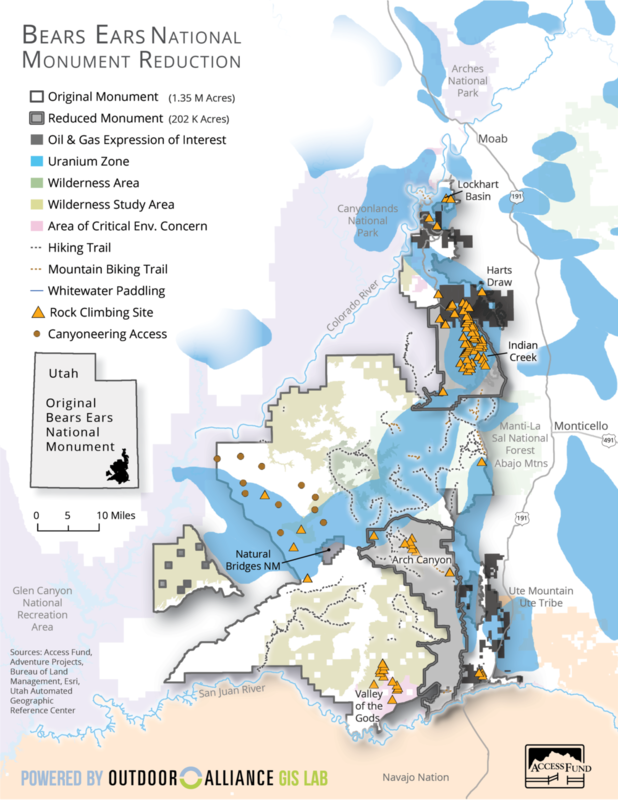 Resource extraction: Our maps show that Trump cut back the monuments in a way to clearly allow for extractive industries to exploit coal (in Grand Staircase-Escalante) and oil and gas (in Bears Ears). Poor land management: Potential resource extraction is not the only issue. The new, fragmented monuments prevent landscape scale management, which makes it more difficult to protect the larger region efficiently. Outdoor recreation: The new proclamations do not mention climbing or recreation. The original monument proclamation for Bears Ears reflected this involvement and included recognition of the importance of outdoor recreation in the area. Monuments do not necessarily protect recreation access, so by losing any mention of recreation, we are much worse off. We must now fight to maintain that ground, and to ensure public access. 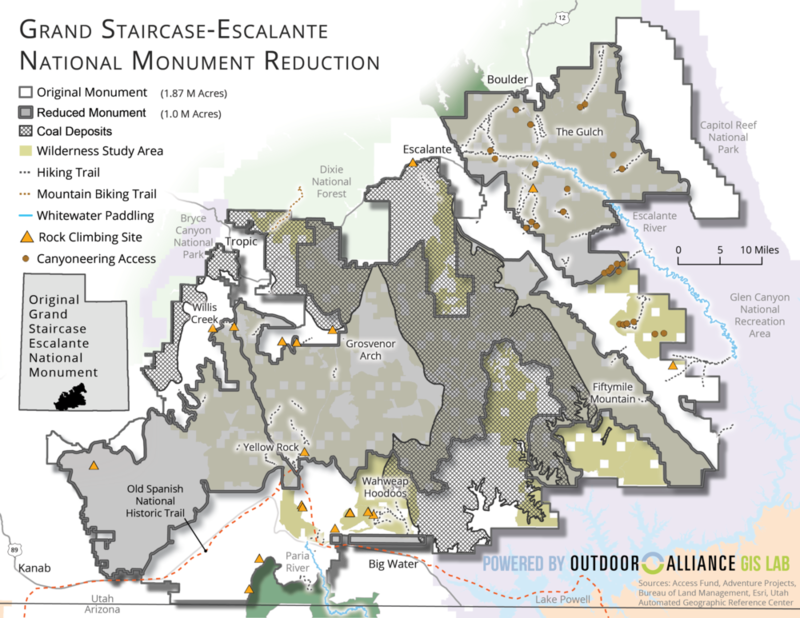 Public access: Both the Bears Ears National Monument proclamation and the Grand Staircase-Escalante National Monument proclamation provided public access for many activities, from climbing to wood and herb gathering. The revised designations put public access at risk. The maps above show more detailed information about the original and revised monument boundaries, as well as recreation resources that will be affected. Among the most important climbing areas that are affected, according to Access Fund, are Valley of the Gods, Harts Draw, Lockhart Basin and a portion of the climbing at Indian Creek, like The Cliffs of Insanity and The Wall. More than 80% of the river miles that had been included in the original monument proposal have been removed.